ABSTRACT: This article formalizes the contexts and procedures by which parody assumes satirical or ironic resonance in musical discourse by drawing on literary perspectives on parody and irony by Linda Hutcheon and Douglas C. Muecke and music-theoretical concepts and applications by Robert Hatten and Esti Sheinberg. Using Hutcheon’s concept of ethos as a point of departure, I develop an interpretive framework for distinguishing the aesthetic motivations that underlie twentieth-century composers’ use of parody. My analysis presents a preliminary set of constructs that models the structure of satire and irony in selected works by Kurt Weill, Peter Maxwell Davies, and Louis Andriessen. In musical discourse, parody and irony present elusive terms that defy concrete analysis. How can parody be systematically distinguished from collage, pastiche, allusion, and quotation in twentieth-century music? Can literary criteria for parody and irony be effectively adapted and expanded toward musical analysis? In an attempt to establish specific criteria for analysis, this article expands on Linda Hutcheon’s literary theory on parody, D.C. Muecke’s writing on irony, and music-theoretical concepts and applications advanced by Robert Hatten and Esti Sheinberg. (5) Hutcheon’s concept of ethos provides a useful interpretive framework for distinguishing the aesthetic motivations that underlie parody, irony, and satire, and their points of intersection. I also build on Hatten’s and Sheinberg’s theoretical positions informed by semiotic theories in constructing a preliminary typology of parodic devices with application to twentieth-century dramatic works. My analysis examines the distinctive parodic strategies that give rise to ironic and satiric ethos in selected works by Kurt Weill, Peter Maxwell Davies, and Louis Andriessen. In the conclusion, further considerations for expanding and refining the typology will be addressed in relation to discourses of intertextuality and postmodernism. First, I define parody in musical discourse as a composer’s appropriation of pre-existing music with intent to highlight it in a significant way. The analyst then determines whether the accompanying ethos is deferential (neutral), ridiculing (satirical), or contradictory (ironic) based on how the new context transforms and/or subverts the topical/expressive meaning of the borrowed element. Specifically, satirical or ironic ethos arises from signals that trans-contextualize and invert or negate the topical meaning of the backgrounded referent. In a piece of music, the signals that invert or negate the literal message may be communicated through sung or spoken text, conflicting musical signifiers, and/or affect or mode of delivery. Second, satirical and ironic ethos are distinguishable by means of their structure of ambiguity, i.e., whether a closure in meaning takes place or the contradictory poles of meaning are upheld. This last point requires further clarification. Both Hutcheon and Sheinberg comment on the ethical implication and didactic purpose that accompany satire’s ridiculing ethos. As a corrective, satire privileges one end of the oppositional poles in meaning, while irony retains its oppositional equilibrium. In terms of the explicitness of communication, satire is more easily recognizable because it tends to rely on an explicit mode of delivery that negates the literal meaning: e.g., “John is a real tiger!” enunciated with a mocking tone of voice openly contradicts the assumption that John is “brave” or “aggressive” like a tiger. In comparison, Mark Anthony’s remark in Shakespeare’s Julius Caesar, “Brutus is an honorable man,” is ironic in intent. A perceptive audience recognizes Mark Anthony’s message as a bitter refrain that fuses the contradictory messages into a source of semantic ambiguity. Irony is communicated more often through implicit rather than explicit signals: in subtle cases, the transliteral message is embedded in the text in such a way that only the culturally and ideologically “competent” audience comprehends the double exposure. Hutcheon’s ethos offers a useful framework for parsing the aesthetic motivations that guided twentieth-century composers to adopt various parodic techniques. Figure 1b lists such motivations synchronically, although such categories are by no means comprehensive or mutually exclusive. One could say that Charles Ives and Alban Berg used quotations as part of a narrative program to portray an event, a character, or an expressive state. Such quotations acquire new meaning through recontextualization, although accompanied by an ethos that falls in the neutral, unmarked region. The trend in postwar music is for neutral ethos to manifest in the ways in which quotations came to be used as a compositional device for fragmentation (Luciano Berio’s colossal experimentation within a collage of quotations in Sinfonia (1968), etc. ), evocation and nostalgia (e.g., George Crumb), spoof on Bach (Peter Schickele), or postmodern eclecticism (e.g., John Corigliano’s The Ghosts of Versailles (1991) or Berio’s Un re in ascolto (1984)). (13) A collage of references permeates Alfred Schnittke’s Concerto Gross (1977) or Jacob Druckman’s Prism (1980), resulting in a stylized web of dense texture without an ironic invocation. Such works fall into the non-overlapping (unmarked) region of parody under Figure 1a; I argue that the backgrounded referent is trans-contextualized through incongruous juxtaposition or superimposition of other elements, yet it does not generate expressive or topical opposition in meaning. Thus only the first condition laid down by Hutcheon is fulfilled. In contrast, dramatic works that incorporate parodic devices with subversive or contesting ethos assume a marked quality and are strongly polarized in the topical opposition between the foregrounded and backgrounded referents. As in the case with the aforementioned painting by Magritte, the incongruity in the juxtaposed elements must be accompanied by an inversion of topical or expressive meaning (i.e. life turns to death). For example, composers driven by a socialist agenda, such as Hanns Eisler and Kurt Weill, adopt parody as a device for alienation. Brecht’s epic theatrical production The Rise and Fall of the City of Mahagonny critiques materialism by appropriating the biblical tale of the flight of Moses and the Israelites and transforming it into the “paradise city” of Mahagonny. The play was first performed in 1930 as an anti-opera, intended to challenge the audience to develop a response other than a merely “culinary” appreciation of the arts. (14) In such contexts, music serves, to a large degree, to critique bourgeois ideals through distortion and exaggeration. In Irony, Satire, Parody, and the Grotesque in the Music of Shostakovich, Sheinberg reveals the extent to which Russian formalist writers informed Shostakovich’s parodic strategies by treating parody as a device for defamiliarization (ostranenye); she considers the term “existential irony” to refer to the composer’s embrace of contradictory signifiers, e.g., musical correlation of “euphoria and dysphoria” in Symphony No. 10 and No. 13. (15) In the last two categories, irony functions as a subject of inquiry unto itself, ushering in a doubly-coded type of ambiguity characterized by fusion or transcendence of contradictory meanings, as will be discussed. Expanding on Hatten’s and Sheinberg’s analyses of irony, I explore several procedures whereby a satirical or ironic ethos is induced through inverting or negating the topical or expressive meaning(16) associated with the borrowed model in twentieth-century musical contexts. 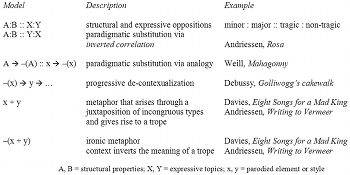 The three constructs are: 1) paradigmatic substitution of expressive state (via inverted correlation or analogy); 2) incongruous juxtaposition of stylistic elements; and 3) progressive de-contextualization of a literal or stylized quotation. These constructs may induce satiric ethos locally or combine in various ways to convey an ironic ethos at broader metaphoric levels of interpretation. Based on Peircian semiotics and Edwin Battistella’s theory of markedness, Hatten defines analogy as a figurative comparison that defines any given relationship in terms of another: A is to B as X is to Y. 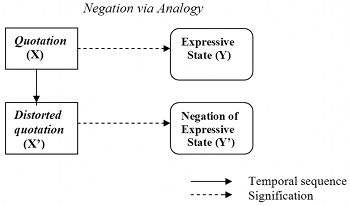 As shown in the left diagram under Figure 2a, correlation is a specific type of analogy that maps structural oppositions onto expressive ones: a literal mapping of signification coordinated by the markedness values between two pairs of oppositions. (17) Correlation is established, according to Hatten, when the modes of signification relate to one another via privative opposition, defined by the presence of A versus the absence of A. He provides a musical example of correlation in the right diagram; the minor/major opposition correlates with the tragic/non-tragic (e.g., galant, heroic) since both minor and the tragic affect are marked with respect to music from the Classical style. Sheinberg offers another formula for structural and expressive oppositions based on equipollent opposition, where the correlation is not based on the coordination of markedness, but rather on semiotic processes of indexicality and iconicity. (20) Figure 3 presents one model by which satire arises via negation based on this principle. When a composer embeds a quotation that connotes a certain expressive state and distorts it, its corresponding expressive state undergoes negation by analogy. This formula for negation is characterized by a distortion or exaggeration of a literal quotation along a temporal axis. Weill’s musical setting of Brecht’s The Rise and Fall of the City of Mahagonny provides an instance of such technique. In scene 9, three men sit at a hotel bar and gloat over their lifestyle of leisure (Example 3). The exaggerated performance of Theckla Badarzewska’s “The Maiden’s Prayer” that opens this scene mirrors the men’s view of the false paradise. In the absence of dialogue, the excessive ornaments and inflated style of playing distort the innocence of the original tune and turn it into a symbol of decadence. Somewhat fittingly, the first comment uttered by one of the three men, is: “Das ist die ewige Kunst” (“this is eternal art”). Since this is the only scene where this tune is parodied, the satirical effect is localized; the distortion of this tune, nonetheless, presents a poignant commentary on the illusory world of Mahagonny. Jimmy, a Christ-like figure who objects to his existence in this fake world of decadence, becomes a pariah and is executed in the end. Since satirical distortion of nineteenth-century salon music constitutes one of Brecht’s stock strategies for ridiculing bourgeois culture, this parodic formula contributes to the trope of anti-bourgeois sentiment in his epic theater. Finally, Figure 4 presents a progressive context in which musical signals de-contextualize a parodied element through the conflation of two procedures: the parodied element undergoes distortion and is then brought into juxtaposition with incongruous stylistic elements. 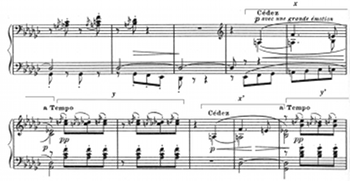 Sheinberg cites Debussy’s “Golliwog’s Cakewalk” as an exemplar of satirical parody; the middle section of this piano piece presents a sentimentalized quotation of the “yearning” leitmotif from Wagner’s Tristan und Isolde. (21) This “yearning” affect is negated by both Debussy’s instruction (“avec une grande emotion”) to exaggerate the sentiment and by the eighth-note figure with grace notes that “mocks” the serious affect of the Wagner quotation. In Example 4, the succession of parodied element and contrasting motive are indicated as x and y to show how the pattern conforms to the model presented in Figure 4a. The exaggerated contrast between the incongruous juxtaposition of musical gestures heightens satire’s ridiculing ethos at work here. While satire arises out of localized forms of substitution or de-contextualization, the structure of irony is embedded within a broader concept of trope or metaphor that arises from the global context of a piece. (22) Hatten explains irony specifically as a trope that emerges from the juxtaposition of contradictory or incongruous types, a generalized category or concept in music that lies beyond the hierarchies of correlation. A preliminary typology may be established as shown in Figure 5. The second and third constructs represent procedures for paradigmatic substitution modeled on Hatten’s and Sheinberg’s work in generating satiric or ironic ethos at the localized level. The remaining constructs apply to the projection of such ethos at a broader, metaphoric or symbolic level. Given x = parodied element, y = a different stylistic element, - indicates temporal adjacency or contiguity of elements, + indicates a juxtaposition of concepts that gives rise to a trope that functions at a broad level of musical discourse, and - indicates contextual inversion of the meaning assigned to a given trope. While the models are listed in the order in which they were presented, context determines the structural levels at which the ethos of satire and irony are sustained. The previous examples demonstrated how satirical effects were generated by means of inverted correlation and paradigmatic substitution; however, such localized effects may be combined with other strategies to project irony at the global level of musical discourse. I’d like to turn now to two dramatic works by Davies and Andriessen to show how the composers adopt a combination of these strategies to prolong the satiric and ironic ethos over the course of an entire scene or a plot. In the seventh song, the King parodies the aria “Comfort ye” from Handel’s Messiah through distortion and exaggeration. This effect is hardly comforting. As shown in Example 5, the distorted Handelian parody is flanked by foxtrot and vaudeville tunes that reference sin. The music oscillates back and forth between tonal and atonal poles. The symbolic death of the violin represents the death of his society. The musical style swiftly shifts to exaggerated expressionistic idioms of the Second Viennese school, leading ironically to the pronouncement of the King’s own death. This seemingly absurd scene nonetheless gives way to a nuanced interpretation of satire and irony at multiple levels of structure. Locally, it is through the strategy of progressive de-contextualization that the satiric ethos is sustained. As shown in Example 5, the Handelian reference x—the parodied style that is historically contemporaneous to the period in which King George lived—undergoes continual distortion (-x). 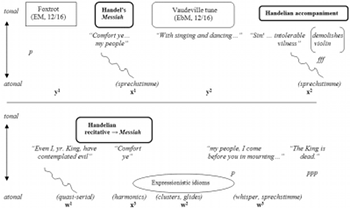 The misquotation of “Comfort ye” from Handel’s Messiah alternates with stylistic allusions to foxtrot and vaudeville (y)—anachronistic genres that have their origins in the early twentieth-century. At the musical surface, the progressive de-contextualization of the Handelian references becomes the primary vehicle for portraying the drama of the King’s state of madness. In the process the musical idiom oscillates back and forth between tonal and atonal poles. Perhaps what is provocative about the piece is that our “normative” expectation—to associate the state of madness with atonality—is turned completely inside out. Davies correlates tonal stability of the foxtrot and vaudeville tunes with decadence and corruption, and the misquotation of Handel with the King’s virtuousness-his attempt to rescue his people in spite of his madness. 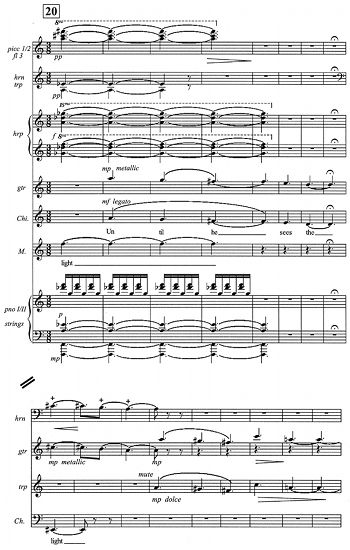 One could argue that Davies prolongs dramatic tension in this scene by mapping tonal and atonal references onto two distinct tropological poles of opposition (tonal: atonal :: decadence: innocence) and (tonal: atonal :: illusion: reality). Thus the borrowed tunes in tonal settings signify the King’s entry into illusion and madness, while destructive passages in atonality signify moments of lucidity and awareness. The King’s wish to “save his people” allows him to escape from the illusory state of madness; however, the awareness of his condition only leads to the realization of his own mortality. From a broader aesthetic realm, madness in this theatrical piece emerges as a trope that is doubly-coded. At the end, the audience is left to grapple with the question: is this piece about King George’s madness or a critique of a society that is in itself mad? By portraying madness as a societal phenomenon, the composer tries to lift the stigma attached to the individual affliction of madness. Thus, framed within a broader hermeneutic framework, the context inverts the conventional meaning associated with madness; if the incongruous juxtaposition of styles constitute x + y as a trope for madness, its meaning is turned inside out. Here, the trope of madness is suggestive of what D.C. Muecke calls double irony—where the opposition lies not between appearance and reality nor individual and society, but rather “between two sides in which both good and bad are mixed.”(25) Furthermore, Davies incorporated stylistic quotations of the foxtrot as a recurring symbol of corruption and decadence in music during the period of the late sixties and early seventies: an indulgence in fake nostalgia that has no connection to reality. (26) By assigning a priori symbolic meaning to stylistic genres, Davies succeeds in creating a distinctive formula for expressing irony through parody as a symbolic gesture of social resistance. Andriessen’s second opera foregrounds dramatic irony as a subject unto its own: Writing to Vermeer (1999), staged in collaboration with Peter Greenaway, depicts the domestic serenity of women in seventeenth-century Holland in stark opposition to the brutality and violence of the outside world. The plot conforms to Muecke’s category of dramatic or Sophoclean irony in which the characters on stage remain unaware of the prospect or “irony of fate” that lies ahead. (27) Contrary to the themes of domestic serenity featured in Vermeer’s paintings, seventeenth-century Dutch society endured turbulent political and socio-economic changes. To provide a dialectic framework to the opera, Greenaway and Andriessen came up with the idea of introducing sudden ruptures or interpolations from the inner world of women and children into the turbulent outer world. The dramaturgical design of the opera consists of six scenes that contrast the domestic serenity of women and children with sudden interpolations into the outer world. Events from the external world such as the tulip crash of 1637, street fights between Catholics and Protestants, and France’s invasion of Holland, are projected onto the stage in the form of a running commentary accompanied by filmic images. Though the inner world of women is kept apart from the outer world in the first half of the opera, the two worlds eventually collide and merge. Throughout the opera, Andriessen places the text and music in continual dialectical tension: while the text speaks of ordinary events in the women’s lives, the music embodies their unspoken emotions. The composer introduces two important devices for the instrumental accompaniment to provide negative psychological commentary to the text: the first is the continual infusion of dissonances to create a paradoxical “shadow” to the women’s expressed optimism, Through harmonizing major themes and motives with poignant dissonances, Andriessen infuses tension into the harmonization of diatonic melodies as if to forecast the impending doom that besets Vermeer’s household. The positively-charged themes and negatively-charged harmonization result in a kind of musical chiaroscuro (play of light and shadow) without tending toward reconciliation. Thus the strategy of dissonance relies on a topical correlation established between music and text, that is, text: music :: positive imagery (light) : negative image (shadow). This correlation is transformed and inverted in the second half of the opera. 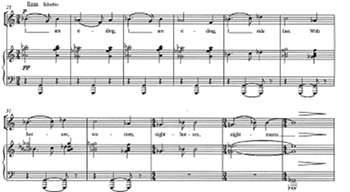 The central leitmotif, the theme to Sweelinck’s “Mein junges leben,” appears in fragmented and varied forms prior to the golden section of the opera where the full statement of the theme appears. (28) As shown in Figure 6, irony manifests in how the incomplete renditions of the Sweelinck leitmotif are associated with positive images—“Saskia’s bright face,” “light,” “sleep,” and so forth—while the complete rendition of the leitmotif reveals negative images of “suffering” and “pain.” Example 6a illustrates an earlier scene in which the descending melody appears in a fragmented form; Vermeer’s stepmother Maria and her children sing about “seeing the light,” accompanied by a tonally ambiguous quotation of the Sweelinck tune that avoids melodic closure. The moment at which the transition from incomplete to complete statement of the theme corresponds with the Golden section of the opera (see Example 6b) and, moreover, the cathartic moment when the women begin to acknowledge their inner emotions of turmoil. Immediately following the filmic projection of street fights between the Catholics and Protestants, Saskia, the model, sings “Mein junges leben hat ein End” in full. At a broader metaphoric level, the de-contextualization of the Sweelinck quotation affirms the act of yearning as a trope that fuses life and death as an inseparable semantic unit. Once the exterior world (x) has penetrated the interior world of women (y) at the Golden section of the opera, the metaphorical union of x + y is established; the further dissolution of leitmotifs past this point signifies the dissolution of (x +y) into an infinite chain of negation. As if to complete the process of dissolution, the sung text disappears after scene 5, as the Sweelinck quotation undergoes chromatic liquidation in the instrumental tutti and dissolves into an electronic “echo” in the postlude to the concluding scene. In his own writings, Andriessen traces his interpretation of irony to Hegel’s dialectical theory in which every condition of existence embodies its opposite in a state of tension. (29) Whereas in Rosa parody functions primarily as a satirical device, in Writing to Vermeer parodied elements (e.g., leitmotif on Sweelinck’s tune) prolong dramatic irony at an implicit, hidden level as a subject on their own. 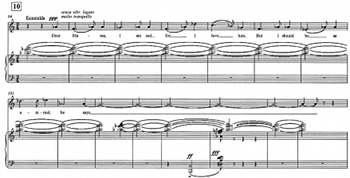 Through distortion of leitmotifs and negatively-charged harmonizations, Andriessen allows the music to function continuously as the “shadow” element to the sung text. It is the progressive de-contextualization of the Sweelinck quotation, spanning the entire opera, that gives rise to and sustains the dramatic irony. The continual transformation and distortion of certain thematic and motivic elements mirror the fluid and vulnerable conditions of the women in the opera. Satiric and ironic ethos are not mutually exclusive; depending on the context, satire may operate independently of irony or it may be subsumed within irony at a lower level of structure. In summary, Figure 7 compares the parodic structure of the four works examined here by mapping their characteristics onto Hutcheon’s chart of ethos introduced at the beginning. Brecht and Weill’s setting of Mahagonny can be located in the intersecting region between satire and parody. The work exemplifies the use of parody as social satire with an explicit didactic message: the futility of materialism. In this context, Brecht leaves little room for the type of interpretive ambiguity that might hint at irony. 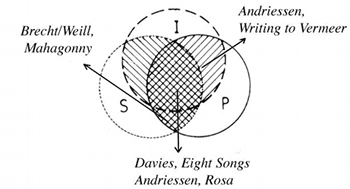 In comparison, Davies’s Eight Songs or Andriessen’s Rosa combine localized satirical ethos with a decontextualization of parodied elements that contributes to a large-scale tropological implication for “double” irony. Satire becomes a means to an end, as Davies confronts madness as a societal disease and Andriessen confronts stereotypes and brutality in cinema. Here, the structure of parody subsumes satire as a low-level manifestation of irony as a form of inquiry. Lastly, Andriessen’s Writing to Vermeer can be situated in the intersecting region between parody and irony. There is nothing satirical in ethos about Andriessen’s later opera that foregrounds Hegel’s philosophy of irony based on infinite negation. Unlike the romantic form of irony, in which contradictory meanings are transformed into a new state of transcendence, the oppositional topics remain fused and open-ended. However dissimilar in background, Weill, Davies, and Andriessen share the same historical vantage point in embracing parodic techniques in order to provoke a social response. All three embrace parodic techniques in order to provide a musical commentary on the socio-political climate for the arts in Western Europe. In the contexts of Davies’s and Andriessen’s works, parody supplants the purity of modernist aesthetic aim while infusing it with the avant-garde’s power of provocation. In their political engagement and critical deconstruction of operatic and theatrical traditions, their aesthetic stance on parody resonates with Hal Foster’s discourse on oppositional postmodernism or postmodernism of resistance. (32) Each composer favors, however, a particular strategy in order to inject an “ironic edge” into their dramatic works: Weill parodies and distorts familiar tunes to ridicule bourgeois sentiment, Andriessen implants leitmotifs and de-contextualizes them to create an opposition between text and music, while Davies embeds topical meanings in quotations and then distorts them through an incongruous juxtaposition of styles. In either case, they establish a dialogue with music from the past in order to inscribe historical continuity with tradition as well as to communicate a particular ideology. It is through this critical distance that these composers mark their differences from within. Andriessen, Louis. Rosa: The Death of a Composer. Nonesuch 79559-2, 2000. _________________. Writing to Vermeer. Recording released by Donemus, Amsterdam, 2000. Davies, Peter Maxwell. Eight Songs for a Mad King. Unicorn-Kachana Recordings DKP 9052, 1987. Debussy, Claude. “Golliwog’s cake walk.” Claude Debussy. Harmonia Mundi HMA 190954, 1972. Weill, Kurt. Aufstieg und Fall der Stadt Mahagonny. Capriccio 10160-10161, 1985. 1. Simon Denitith, Parody (London and New York: Routledge, 2000), 22–23. 2. Rey M. Longyear, “Beethoven and Romantic Irony,” in The Creative World of Beethoven, ed. Paul Henry Lang (New York: W. W. Norton, 1970), 147. 3. Mikhail Bakhtin, The Dialogic Imagination, trans., Caryl Emerson and Michael Holquist, ed. Michael Holquist (Austin, TX and London: University of Texas Press, 1981). 4. Linda Hutcheon, Theory of Parody: The Teachings of Twentieth-century Art Forms (New York and London: Methuen, 1985). 5. Robert S. Hatten, Musical Meaning in Beethoven: Markedness, Correlation, and Interpretation (Bloomington: Indiana University Press, 1994); Esti Sheinberg, Irony, Satire, Parody and the Grotesque in the Music of Shostakovich: A Theory of Musical Incongruities (Aldershot: Ashgate Publishing, 2000). I am deeply indebted to both Hatten and Sheinberg for their guidance in conducting this research. 7. Here, referent is synonymous with the object of a manifested sign (sinsign) or designatum according to Charles Peirce’s semiotic theory (Hatten, 258). 8. A more subtle semantic inversion can be noted in the substitution of the flower in the left-hand corner of the painting: in Italy, the white chrysanthemum signifies death. 9. Ibid., 55. Her concept of ethos draws on the work by the Groupe MU in Rhétorique generale (Paris: Larousse, 1970). 11. See Edwin L. Battistella, The Logic of Markedness (New York: Oxford University Press, 1996). For instance, the opposition between man and woman are defined by markedness values since the former includes the latter in creating a categorical asymmetry. 12. Hutcheon, 34. In supporting Kristeva’s position, Roland Barthes defines intertexuality as a modality of perception, an act of decoding texts in light of other texts. 13. For a discussion of Corigliano’s opera, see Jane Piper Clendinning, “Postmodern Architecture/Postmodern music,” in Postmodern Music/Postmodern Thought, eds., Judith Lockhead and Joseph Auner (New York: Routledge, 2002): 119–140. 14. Roswitha Mueller, “Learning for a new society: the Lehrstück” in The Cambridge Companion to Brecht, eds. Peter Thomson and Glendyr Sacks (London: Cambridge University Press, 1994), 79–81. 15. Sheinberg, 43–49; 316–317. Her contextualization of “existential” irony in Shostakovich’s late symphonies derives from Hegel’s and Kirkegaard’s approach to irony as the embodiment of the dialectical principle of negation. 16. A parodied element may reference a particular topic that indexes a stylistic convention, like the Dies Iraes motive that signifies death or the lamentoso bass line that triggers a Baroque-style tragic effect (Hatten, 61). 18. The opera begins with the investigation of Rosa’s mysterious death, followed by scenes that retrace the events that led to his murder. 19. For instance, the presence of the harmonica that doubles the melody was intended as a musical tribute to Ennio Morricone, the celebrated composer of spaghetti-westerns, which are in themselves parodies of Hollywood westerns. Morricone uses the harmonica as a recurring device in his musical setting of the film Once upon a time in the West. 20. Sheinberg, 23. In equipollent opposition, A vs. B, where A=not B and B=not A, neither poles are based on markedness. 21. Ibid., 146. In this case, the signals that efface the affect of “yearning” are multiple: the expressive marking “avec une grande emotion” that exaggerates the quoted motif and the incongruous juxtaposition of the grace-note figures that make a mockery through simulating laughter. 22. Ibid., 170. Hatten defines trope as “a species of creative growth that goes beyond the typical articulation of established types and their implied hierarchy. Troping akin to metaphor occurs when two different, formally unrelated types are brought together in the same functional location so as to spark an interpretation based on their interaction” (295). 23. Paul Griffiths, Peter Maxwell Davies (London: Robson Books, 1982), 67. 25. Douglas C. Muecke, Irony and the Ironic (New York and London: Metheun, 1970), 28. 26. Griffiths 67. Foxtrots masquerade as pavanes even in a Purcell arrangement Davies made in 1968. 28. In close approximation to Peter Burkholder’s concept of cumulative form in Ives’s music, the variations precede the full statement of the theme. See Peter J. Burkholder, All Made of Tunes: Charles Ives and the Uses of Musical Borrowing (New Haven and London: Yale University Press, 1996). 29. Louis Andriessen, The Art of Stealing Time: Louis Andriessen, English translation by Clare Yates (East Sussex: Arc Music 2002), 329. 31. For a more comprehensive discussion on intertextuality, see Michael Klein, Intertextuality in Western Art Music (Bloomington: Indiana University, 2005), 11–13. 32. Hal Foster, The Anti-Aesthetic (Seattle, WA: Bay Press, 1983), xii. In this vein, Harrison Birtwistle’s Punch and Judy (1966–7) stands out as one of the most provocative non-traditional opera that assimilates aspects of Greek tragedy, Baroque opera, and the Bach Passions. Simon Denitith, Parody (London and New York: Routledge, 2000), 22–23. Rey M. Longyear, “Beethoven and Romantic Irony,” in The Creative World of Beethoven, ed. Paul Henry Lang (New York: W. W. Norton, 1970), 147. Mikhail Bakhtin, The Dialogic Imagination, trans., Caryl Emerson and Michael Holquist, ed. Michael Holquist (Austin, TX and London: University of Texas Press, 1981). Linda Hutcheon, Theory of Parody: The Teachings of Twentieth-century Art Forms (New York and London: Methuen, 1985). Robert S. Hatten, Musical Meaning in Beethoven: Markedness, Correlation, and Interpretation (Bloomington: Indiana University Press, 1994); Esti Sheinberg, Irony, Satire, Parody and the Grotesque in the Music of Shostakovich: A Theory of Musical Incongruities (Aldershot: Ashgate Publishing, 2000). I am deeply indebted to both Hatten and Sheinberg for their guidance in conducting this research. Here, referent is synonymous with the object of a manifested sign (sinsign) or designatum according to Charles Peirce’s semiotic theory (Hatten, 258). A more subtle semantic inversion can be noted in the substitution of the flower in the left-hand corner of the painting: in Italy, the white chrysanthemum signifies death. Ibid., 55. Her concept of ethos draws on the work by the Groupe MU in Rhétorique generale (Paris: Larousse, 1970). See Edwin L. Battistella, The Logic of Markedness (New York: Oxford University Press, 1996). For instance, the opposition between man and woman are defined by markedness values since the former includes the latter in creating a categorical asymmetry. Hutcheon, 34. In supporting Kristeva’s position, Roland Barthes defines intertexuality as a modality of perception, an act of decoding texts in light of other texts. For a discussion of Corigliano’s opera, see Jane Piper Clendinning, “Postmodern Architecture/Postmodern music,” in Postmodern Music/Postmodern Thought, eds., Judith Lockhead and Joseph Auner (New York: Routledge, 2002): 119–140. Roswitha Mueller, “Learning for a new society: the Lehrstück” in The Cambridge Companion to Brecht, eds. Peter Thomson and Glendyr Sacks (London: Cambridge University Press, 1994), 79–81. Sheinberg, 43–49; 316–317. Her contextualization of “existential” irony in Shostakovich’s late symphonies derives from Hegel’s and Kirkegaard’s approach to irony as the embodiment of the dialectical principle of negation. A parodied element may reference a particular topic that indexes a stylistic convention, like the Dies Iraes motive that signifies death or the lamentoso bass line that triggers a Baroque-style tragic effect (Hatten, 61). The opera begins with the investigation of Rosa’s mysterious death, followed by scenes that retrace the events that led to his murder. For instance, the presence of the harmonica that doubles the melody was intended as a musical tribute to Ennio Morricone, the celebrated composer of spaghetti-westerns, which are in themselves parodies of Hollywood westerns. Morricone uses the harmonica as a recurring device in his musical setting of the film Once upon a time in the West. Sheinberg, 23. In equipollent opposition, A vs. B, where A=not B and B=not A, neither poles are based on markedness. Ibid., 146. In this case, the signals that efface the affect of “yearning” are multiple: the expressive marking “avec une grande emotion” that exaggerates the quoted motif and the incongruous juxtaposition of the grace-note figures that make a mockery through simulating laughter. Ibid., 170. Hatten defines trope as “a species of creative growth that goes beyond the typical articulation of established types and their implied hierarchy. Troping akin to metaphor occurs when two different, formally unrelated types are brought together in the same functional location so as to spark an interpretation based on their interaction” (295). Paul Griffiths, Peter Maxwell Davies (London: Robson Books, 1982), 67. Douglas C. Muecke, Irony and the Ironic (New York and London: Metheun, 1970), 28. Griffiths 67. Foxtrots masquerade as pavanes even in a Purcell arrangement Davies made in 1968. In close approximation to Peter Burkholder’s concept of cumulative form in Ives’s music, the variations precede the full statement of the theme. See Peter J. Burkholder, All Made of Tunes: Charles Ives and the Uses of Musical Borrowing (New Haven and London: Yale University Press, 1996). Louis Andriessen, The Art of Stealing Time: Louis Andriessen, English translation by Clare Yates (East Sussex: Arc Music 2002), 329. For a more comprehensive discussion on intertextuality, see Michael Klein, Intertextuality in Western Art Music (Bloomington: Indiana University, 2005), 11–13. Hal Foster, The Anti-Aesthetic (Seattle, WA: Bay Press, 1983), xii. In this vein, Harrison Birtwistle’s Punch and Judy (1966–7) stands out as one of the most provocative non-traditional opera that assimilates aspects of Greek tragedy, Baroque opera, and the Bach Passions.